ST. GEORGE – The Lake Powell Pipeline flows a little closer to reality as federal regulators said Monday they are moving forward with an environmental analysis of the project. The Federal Energy Regulatory Commission, or FERC, announced it had accepted the hydropower license application for the pipeline project that was submitted last year by the state. The commission will be initiating an environmental study to determine the project’s feasibility. A public comment period will last into early February. 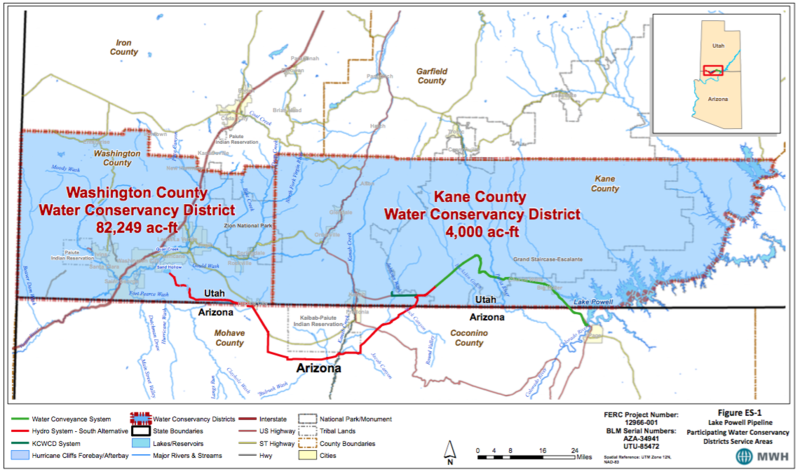 The proposed 140-mile long, 70-inch diameter pipeline is designed to taken water from Lake Powell to Sand Hollow Reservoir in Washington County. The pipeline is anticipated to bring 77 million gallons of water daily to 13 communities in Washington and Kane counties. According to FERC, the pipeline will carry water 50 miles uphill from Lake Powell to a high point in the Grand Staircase Escalante National Monument, with the remaining 90 miles running through a series of hydroelectric turbines on the way to Sand Hollow. Communities in Washington County get their water from a single source – the Virgin River. State and county water planners have said for years that the county needs to diversify its water resources, especially in light of expected growth in population. Washington County is projected to have a population of 400,000 by 2060. The Washington County Water Conservancy District has said the development of current water resources and conservation will only be able to make up a little over half of the water supply needed to sustain a population that size. 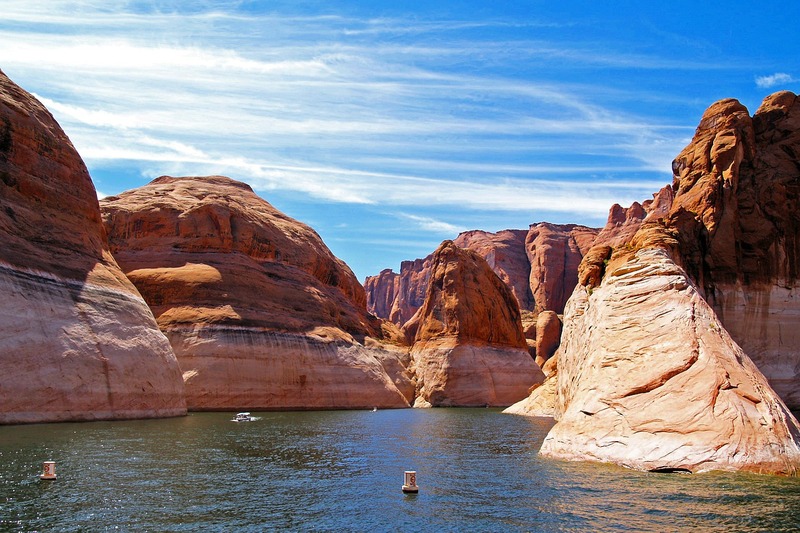 The Lake Powell Pipeline, water district officials say, will be able to supply the rest. FERC has overseen the application due to the six hydroelectric turbine generation stations to be built along the pipeline’s route. Those facilities will supply some of the energy to power pump stations moving water through the pipeline. While the commission has jurisdiction over those facilities, it stated Monday that it is reviewing whether it has jurisdiction over the rest of the project’s components. Zach Frankel, executive director of the Utah Rivers Council and a longtime pipeline opponent, told The Salt Lake Tribune that if other federal agencies become involved, the pipeline could face more intense National Environmental Policy Act review. FERC spokeswoman Celeste Miller said the commission plans to produce documentation required by other agencies, such as the National Park Service and the Bureau of Land Management. Those agencies, along with others under the U.S. Interior Department, are already heavily involved in the process, said Ron Thompson, general manager of the Washington County Water Conservancy District. “In terms of significance, it really won’t make any difference,” Thompson said. The process of establishing jurisdiction over the project in whole or in part is a way for the agencies to determine which one will be the lead agency overseeing the project, he said. “It really shouldn’t make much difference in the long run,” Thompson said, adding that he expects to see the environmental study to finish sometime in 2019 with a conclusion favoring the Lake Powell Pipeline. If all goes well, construction on the pipeline could begin in the early 2020s. FERC has opened a public comment period lasting 60 days of the issuance of the go-ahead for the environmental study. Those wishing to comment can visit the agency’s website. The project number is P-12966-004. Ahhh….400,000 people here in Washington County, doesn’t it just make you feel all warm and fuzzy inside? …The greed machine is at full steam…steam rolling over your quality of life people,… oh well, enjoy! I find it truly saddening to agree with your comments, UD. Saddening because I do NOT want unbridled growth in the county at large and St George in particular. In fact I am the anti voice to growth at all. I expect this will draw the whiners out of the woodwork but it won’t change my position on growth and the Lake Powell Pipeline. Wouldn’t it be cheaper just to erect an enormous statue of Ron Thompson and let the developers and other land pimps struggle elsewhere. Local & state government officials — lackeys of the chamber of commerce — want their shiny new toy pipeline so that wealthy developers, builders, and contractors can continue to line their pockets at the expense of ordinary people. Officials have been shown over and over how Washington county can easily double and triple its current population without spending billions of dollars on a pipeline to Lake Powell. Water conservation and conversion of irrigation water rights can provide the water that is needed for decades of growth. But, driven by extreme greed, officials cannot be dissuaded from a path that will ultimately cost all county property owners dearly as the water district radically increases property taxes to pay for construction and operation of the extremely expensive and unnecessary pipeline. Even if there isn’t a drop of water to be had in Lake Powell, Washington County taxpayers will still foot the bill for the pipeline. Of course, restricting growth to a reasonable rate rather than encouraging the rampant, out-of-control growth we are currently experiencing would also go a long way towards stretching our water resources. The chamber of commerce won’t allow their lap dogs in government to even mention such a “radical” concept, though! I see three comments above that reference greed and unbridled growth. Both of which are thrown around a lot to besmirch and belittle the pipeline and anyone supporting it. No one in this county wants unbridled growth, suggesting that they do is just a scare tactic. It’s also completely illogical, we have water now and are we seeing unbridled growth? The county will continue to grow as it has always done. Those that speak against any kind of growth are saddled with “first settler syndrome.”. I have my little slice of heaven, now don’t let anyone else come here and ruin it. Greed. Is it greed to want to make money? How are you feeding your family of you don’t make money? Land development is a risky business, I think we should be grateful to anyone willing to risk it all to provide you a place to live. If the reward wasn’t potentially great, then no one would do it. All the professionals agree that the county will run out of available water at some point. That point is not up for discussion. We can do better, but we cannot conserve our way to zero and sooner or later the local resources will not be enough. Can we not get together and find a way to help this area that we love to continue to be great?